Fighting cavities has never been more fun! Colgate introduces Flouride toothpaste for kids that comes in two exciting flavours with your favourite cartoon characters and helps protect against cavitites.Developed with the help & expertise of pediatric dentists for permanent teeth, the Colgate Barbie toothpaste in delicious strawberry flavour is specially formulated for kids of ages 6 and above, designed with the expertise of pediatric dentist to meet the special needs of newly erupted, developing permanent teeth. The special formulation of Colgate's range of toothpaste for kids is mild and safe to use on children's teeth and gums to effectively fights germs and cavities. The kids toothpaste comes in a convenient stand-up tube making it easy to handle and fun to use for kids. 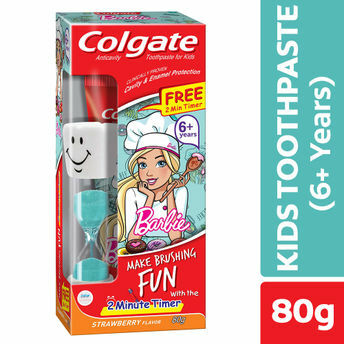 The Colgate kids toothpaste for kids comes in an attractive Barbie packaging, with a sparkling colorful gel and a refreshing flavor that will make your child look forward brushing twice every day! Additional Information: Trusted by Millions across the world, Colgate-Palmolive is a global household and consumer care brand producing safe and effective personal care products.From oral care to personal care, from home care to pet nutrition, Colgate-Palmolive makes the products that make you smile.Colgate is No.1 toothbrush and toothpaste brand , offering quality oral care products, including toothpastes and toothbrushes, as well as expert dental health information.